Bruce believed that people had lost the power of decision which should belong to them in a democracy. In his memory, I’d like to carry on the conversation we had about this. I should say something about my relationship with Bruce. I first met him in court. I was working, and he was charged with breaking windows in a development in Freeman’s Bay in a protest against the Auckland City Council’s building houses for the rich. We were political opponents for a good few years and didn’t get to know each other until I was winding down my time in parliament. He wrote what I still believe was a lot of nonsense about me when I was in office. We had differing interests in politics. I’ve always been interested in politics as performance. I like the drama of it. When I was in it, I loved the contest, and I didn’t go into it to be nice to my opponents. Bruce was far more dispassionate. He could reject an argument without dismissing its advocate. He was probably less interested in personality than in ideas and how they worked in practice. He thought deeply about politics and the nature and uses of political power. I won’t try to match him. What I’m going to do is take as my starting point the last chapter of his last published work. The chapter carries the heading There Is Always An Alternative. In broad terms, it suggests how New Zealand might be rebuilt after its transformation of the last fifteen years. What strikes me about Bruce’s proposals is that many of them have been adopted, or at least acknowledged, by the present government. Some of them, of course, have been misinterpreted, or rejected. This evening I’m going to look at Bruce’s alternative through my own understanding of the political process, and try to answer the question he put at the very end of his last work, when he said “In the end it comes down to something as basic as that: political power, who wields it and what is done with it”. 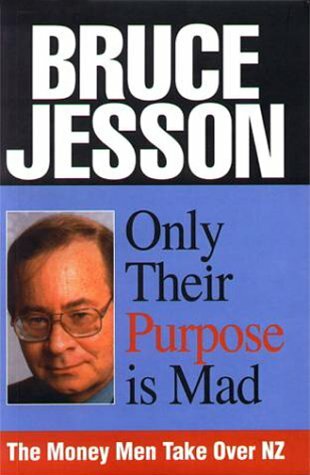 In his last work, Bruce described a country in which commercial values have come to dominate. What Bruce called the benign and humane role of the government vanished when government began to make a virtue of doing as little as possible at as low a price as possible. Government is now characterised by its officious or oppressive elements. This, in Bruce’s analysis, is especially unfortunate in a country like ours, where many of our economic and social institutions were the creation of the state. He called it a hollow society, and argued that when the government adopted a commercial culture it left us without much of a society at all. We don’t, he said, have much of a sense of self, and we’re too inclined to think that because we’re small we must be powerless. 1984. But I don’t dispute the judgement that something has gone badly wrong, and that the failure can’t be separated from the government and what it does. I entirely agree with Bruce in his refusal to accept that our country is destined to be tossed around on the tide of globalisation. If there is a country called New Zealand, and that country has a responsible government, then we engage with the world on the terms we choose for ourselves. We choose, and we live with the consequences of our choices, for better or worse. What I want to talk about tonight is whether we really have the means to make that kind of choice. I’ll briefly run through the strategy which Bruce suggested might be adopted by a reforming government, and compare it with what the present government is actually doing. He argued that there should be curbs on speculation, or the creation of an environment which discourages it, so that investment is channelled towards the productive sector. There are signs, like the new takeovers code, that the government wants an orderly market. Saving should be encouraged, because there are limits to our reliance on foreign capital. I see the plan to pre-fund superannuation as much in this light as in light of a solution to a contemporary political problem. There should be an industry policy. The government is developing one. There should be a return to collective wage bargaining. The law now allows its return. Bruce also suggested that the government actively manage and develop its assets, and that it should have a planning function. In fact, I think it’s almost impossible for the public sector, in its present form, to do this successfully. Bruce was well aware of its limitations, and argued for its remodelling. I’m not sure that we would have agreed on the form the remodelling should take, but one way or another, remodelling is critical. It is one of the government’s most significant challenges, because the core public service has become an imperfect instrument of policy. Before I come back to this point, I’ll complete my summary of Bruce’s blueprint for a reforming government. about capacity-building, in the provision of community health services, and across the board n the voluntary sector. Now I come to issues which are more problematic. Members of the executive branch of government are more than our representatives. They’re more than managers. They are, or should be, our leaders. Bruce clearly identified some of the important elements of leadership, although he didn’t call it that. He was adamant that a reforming government would need a definite point of view, based on its own social, democratic and national goals. I don’t believe that the government has yet clearly established its goals. It tells us frequently that it has rejected the past, but I saw, by way of example, a speech made recently by the minister of finance in which he listed the pillars of economic policy of the last decade, and told his audience most emphatically that they hadn’t altered. In this most important area, the government appears to be looking two ways at once. I don’t intend here to be critical of what the minister is actually doing. I’d be dismayed if he suddenly dismantled the whole framework of economic management without having first laid the groundwork for whatever is going to replace it. My point is only that the rhetoric leaves us uncertain if that is actually what is intended. The prime minister used to say that hers is a social democratic government. With respect, this is a phrase that has no meaning outside a school of political studies, and strikes no chord among the public. For whatever reason, the government tends not to put its actions in any kind of significant context. There are for instance any number of reasons why the government should have replaced the employment contracts act with something more humane and potentially far more productive. But the impression left with me as an observer was that the government was doing it because it had said it was going to. It sounded just as defensive when it passed the accident compensation legislation. Here is another example. In my view, one of the government’s most important actions was the full restoration of school zoning, a decision which carries implications for education which go far beyond Epsom property values and the grammar zone. I’ll go into this further when I talk about the public sector, but the decision must mean that the government has rejected the market model of schooling and is attempting to restore the ideal of equality of opportunity in education. But if that is its goal, it hasn’t got it across to the general public, so that it seems to have left the field to a few disgruntled parents who can’t get their children into the school of their choice. It’s hard in all of this to identify what Bruce called a point of view, or I would call an idea. This is a way of thinking which can be applied to any particular proposal, and is a yardstick by which the government and others may judge its actions. The most powerful ideas are very simple, however difficult their implementation might be in practice, and all-encompassing. Equality of opportunity is one. Full employment is one. The knowledge economy doesn’t really seem to be one, because it has nothing to say to a large part of the population. The Greens have an idea which appears to guide almost everything they do. If a proposal can’t meet the standards of sustainable development, they won’t support it. In the eighties and nineties, the idea which came to dominate was the ideal of the market. an exercise in nation-building. It’s obvious from its rhetoric that, consciously or not, the government agrees with him, although some of its members seem to have missed the point of it. In the last few days I’ve heard two very dissimilar ministers inform the public that the government is engaged in nation-building. This must be disconcerting for anyone who imagined that we already lived in one. Bruce can’t possibly have intended the words to be flung around in the abstract, and in fact what he proposed was an exercise which had the establishment of a republic as its focal point. In other words, there has to be an object to the exercise, and one which is capable of commanding broad-based support. My guess is that the leading figures in the government understand this perfectly well. But what has happened in practice to the government’s attempt to seize the high ground has brought it close to crisis. When the government took office it announced that it intended to close the gaps between rich and poor. That is an honourable goal for parties on the left of politics and an entirely appropriate stance for a government which wishes to revisit the policies of the recent past. It is quite capable of being what Bruce called an organising concept, the yardstick by which the government measures its actions. But whether the government meant it to happen or not, the goal has been redefined in the public mind. If the government today talks about closing the gaps, it is understood as closing the gaps between Maori and the rest. Rather than unifying, it appears divisive, and the idea has done little more to date than erode the government’s popular support. fact been obliged to follow a course which is both less than it intended and ultimately futile. Let me look in the first place at the government’s capacity to turn policy into practice. It’s become commonplace to observe that the more competent among the government’s ministers are overburdened with work. This is an odd reflection on the nature of the restructured public service, since one of the aims of its reform was to relieve ministers from administrative detail and allow them to concentrate on wider issues. I know from experience that many ministers were overburdened with detail in the 1980s, and I know that there was much that was inefficient, ineffective or downright frustrating in the old public service. A large part of its restructuring was based on principles which had gained currency world-wide by the beginning of the eighties, and which can be summed up very simply by saying that you get the most from your resources if you allow managers enough freedom to manage so that they can be held accountable for their performance. If that was all we’d done, I doubt there would be much to say that was critical about the performance of the public service. But we didn’t stop at that. The state sector act 1988 and the public finance act 1989 go far beyond the mainstream in their approach to public sector management. They are at the very extreme of practice. This almost certainly seemed like a virtue at the time. Several years of looking at the results has persuaded me that nobody else does it the way we do because nobody else would take the risk. It is not orthodoxy as much as oddity. The guiding assumption of our modern public service is that people act in their own self-interest. In light of this premise, managers can be made accountable only by means of contract. This is why the public service today is structured on commercial principles, even where there is no obvious commercial focus of its activities, and why ministers must purchase services from their departments, and why departments flood ministers with the reporting necessary to demonstrate their compliance with financial requirements. Ministers must submit to a ritual of purchasing services from departments they ostensibly own, while in practice they can’t act like the owner of an asset because the short-term demands of purchasing always defeat the long-term interests of ownership. Ministers can’t in practice develop the resources of their departments, and departments which might wish to plan for the future find themselves obliged to give priority to the current year’s outputs. The greatest absurdity of all is that the theory of contracting makes sense only if there is competition between providers of services. Ministers and their departments don’t actually work like this, but they’re condemned to an endless and wearying charade of behaving as if they do. Reducing accountability to a matter of contract has given us a wonderfully efficient, but hopelessly limited, sometimes insolent, and ineffective public service. Leaving it as it is will mean that some of the policies the government wishes to promote can’t possibly work. I include among them its industry policy, its regional development policy, and many of its social policies, including its remodelling of the health sector. I can probably best explain what I mean by using as an example the recent history of the ministry of education. Here I go back very briefly to the devolutionary system of school administration which has always been known as Tomorrow’s Schools. I’m resigned to dying without ever convincing the left of politics that the whole thing wasn’t a Treasury plot, but I can only say, as I’ve often said before, that, whatever might have become of it, it was originally a democratic scheme of management. It was a devolutionary scheme because equality of opportunity doesn’t always mean acting as if everybody was the same, and because you can’t run everything from Wellington. The model was designed to allow schools to be different. It rejected the market model of schooling, and it did so by insisting that children go to the local school. Its driving force was democratic participation in schooling. If the local school was not the best school it could be, parents and others were entitled to make their voice heard, up to and including the point where new arrangements could be made locally for the schooling of some or all of the students. As well as boards of trustees, there was a parents advisory council, long since abandoned, to assist parents in making a case, and community education forums, also a non-starter, to thrash out the issues and communicate local views to the government. It’s hard to believe all these years on that the scheme was greeted with great enthusiasm, but it was. The government got 20,000 responses to its proposals inside six weeks, and almost all of them were welcoming. The democratic elements of the scheme were soon subverted. This was partly a matter of choice by a successor government, which did away with school zoning in an attempt to create a market in education in which schools would stand or fall on the basis of parental preference. But it was also the result of the inability of the public service to respond appropriately to a devolved model of administration, and it’s this which gives most cause for concern about the capacity of the present government to implement its policy. The model depended on constructive engagement between government and the school community. This kind of engagement is what the government today calls partnership. It demands at the very least close contact between government agencies and the school community. It requires the government to know local needs and local capacity and have some idea of local intentions, so that it can plan accordingly. In turn the local community should understand the government’s intentions as a funder, a provider or a regulator of services, and perhaps have some influence on those intentions, or be influenced by them. Critically, the partnership model demands a response from government. In the original scheme of Tomorrow’s Schools, the education review office was designed to monitor not only the performance of schools but also the government’s performance in allocating resources and in maintaining a supportive national infrastructure. Not surprisingly, this function soon fell by the wayside. The model came to be characterised, not by the government’s active engagement with the school community, but with its frequent passivity in the face of school failure. As far as I know the ministry of education has been through three major restructurings since 1989, and several smaller ones. It became as a matter of choice a hostile environment for staff who identified with the education sector. Collaboration with practising educators was actively discouraged. The ministry closed its small regional offices, so that schools lost contact with officers who could reasonably be expected to know them and their special circumstances. The ministry soon lost touch. It came up with crackpot schemes like allowing schools to set their own holidays, it neglected issues like truancy which have national implications, and you couldn’t get it to intervene in a failing school unless you threatened it with publicity. When ministers in the last government felt the political pressure of issues like disastrous school failure in Northland, South Auckland and the East Coast, they suddenly demanded intervention, placing a hopeless load on the few staff in the ministry who knew what to do. The ministry’s interventions were too often reluctant, clumsy and uninformed. This experience is the basis of my concern about the government’s efforts to achieve what it calls a rebalancing of its economic policy through initiatives like its industry policy and its regional development policy. Both demand that the government’s agencies engage actively with the community. If they don’t, the government’s planning, if it does any, is uninformed, and its interventions take on the nature of a gamble. But the public service as it is now is not geared for constructive engagement with the community. It doesn’t have the people, it doesn’t have the resources and because of its contractual limitations, it doesn’t have the will. representative element injected into the mix through partly-elected local boards. The government obviously doesn’t intend to be a mere spectator while the new boards get on with it, so the question must then arise of whether the agencies of central government are ready to take up their role in the partnership. An effective health sector demands that some agency of central government be ready to monitor performance and improve it, to prevent failure or remedy it, to plan for the future and work constructively with a range of partners in a diverse and inherently difficult sector. As far as we can tell at the moment, the ministry and the health funding authority between them can’t manage a simple national screening programme. We’re condemned to some years yet of trial and error in the health sector. As happened in education, the democratic elements of the scheme will almost certainly be subverted by its contractual elements. I don’t want to leave you with the impression that any of this will come as news to the government. The minister of state services says that the public service puts too much emphasis on financial competence, that it’s too fragmented, that it doesn’t have a broad view of the national interest, that it’s lost sight of the values and standards of public service and that it doesn’t have the capacity to engage with the communities it serves. The minister is not planning to amend the state sector act or the public finance act. He does not anticipate major structural change in this term of office, other than in the health sector, arguing that it is too disruptive and damaging to morale. He prefers to encourage changes in what he calls approach, style and culture. Just as the government leaves the pillars of economic policy unaltered while it rebalances the economy inside the existing framework, it leaves the structure of the public service unaltered while it changes the attitudes of the people who work in it. The danger for the government is that it gives us nothing to hope for. It repudiates the economic and social policy of the recent past, and deplores the inequality they have created. It doesn’t say how far its repudiation will go. Until it does, its interventions may seem like tinkering and inevitably foster the suspicion that it doesn’t intend to go very far at all. I doubt if Bruce would have been surprised at this. He wrote in his last work that Labour politicians in particular seemed intimidated by the situation they faced, and he doubted that there were any contemporary politicians bold enough to remove what he called financial coercion from the public service. It would be wrong to see that as any reflection on individual politicians. The government can be bold. It has been almost recklessly bold in its dogged pursuit of a wrong idea. Here I come back to the government’s aim of closing the gaps between rich and poor, and the way in which it was overtaken in public understanding by the subsidiary goal of closing the gaps between Maori and the rest. I don’t describe the second goal as lesser than the first out of any wish to minimise the effect of growing inequality on Maori people. What I mean is that from the point of view of a democratic government, the first goal can encompass the second, but the second can’t encompass the first. If the government’s goal is to reduce inequality, it follows that it will do whatever it can to improve the position of Maori. How goals like this are achieved is the whole business of politics. It is not particularly easy politics, because the racial element always makes politics difficult, however you handle it. In this country there is the history of dispossession and displacement. There is the growing number of people who identify as Maori. There is the growing number of those who wish to wield political power as, and on behalf, of Maori, and increasingly have the means to do so. These are challenges to the political process, but they are not insurmountable. Democratic government can accommodate Maori political aspiration in many ways. It can allocate resources in ways which reflect the particular interests of Maori people. It can delegate authority, and allow the exercise of degrees of Maori autonomy. What it cannot do is acknowledge the existence of a separate sovereignty. As soon as it does that, it isn’t a democracy. We can have a democratic form of government or we can have indigenous sovereignty. They can’t coexist and we can’t have them both. This brings me to the preoccupation of successive governments with the Treaty of Waitangi. It is with no disrespect for Maori feeling for the treaty that I have to say it means nothing to me. It can mean nothing to me because it has nothing to say to me. When I was in office I understood that the government had succeeded to certain legal and moral obligations of the government which signed the treaty, and that in so far as those obligations had not been met it was our responsibility to honour them. But that is the extent of it. such, and the other claims that it’s your links to traditional forms of association which define you as Maori. As our increasingly dismal national day continues to show, the treaty is no basis for nationhood. It doesn’t express the fundamental rights and responsibilities of citizenship, and it doesn’t have any unifying concept. The importance it has for Maori people is a constant reminder that governments in a democracy should meet their legal and moral obligations, but for the country taken as a whole, that is, and must be, the limit of its significance. Here I come to the dangers posed by the increasing entrenchment of the treaty in statute. The treaty itself contains no principles which can usefully guide government or courts. It is a bald agreement, anchored in its time and place, and the public interest in it is the same as the public interest in enforcing any properly-made agreement. To go further than that is to acknowledge the existence of undemocratic forms of rights, entitlements, or sovereignty. The treaty is a wonderful stick for activists to beat the rest of us with, but it could never have assumed the importance it has without the complicity of others. It came to prominence in liberal thought in the seventies, when many who were concerned about the abuse of the democratic process by the government of the day began to see the treaty as a potential source of alternative authority. It’s been the basis of a self-perpetuating industry in academic and legal circles. Many on the left of politics who sympathise with Maori aspiration have identified with the cause of the treaty, either not knowing or not caring that its implications are profoundly undemocratic. I don’t think it any coincidence that the cause gained momentum in the eighties and nineties, when the government retreated from active engagement in economy and society and in doing so weakened the identification between government and governed which is essential to the functioning of a democracy. It isn’t in the least surprising that undemocratic ideas flourish when democracy itself seems to be failing. I think that in practice the present government will find it difficult to draw back from its public commitment to the treaty, and that this will almost certainly rob it of its chance to build a more cohesive society and a more productive economy. It has, in the public mind if nowhere else, adopted a goal whose pursuit is inevitably divisive, and it is spending its political capital on it almost by the hour. The result, if the worst comes to the worst, will be a fractured society in which political power will be contested in ways beyond the limits of our democratic experience. groundwork for greater change in the future, or it may be tinkering. It’s impossible to be sure. The government is diffident in its language and has not yet succeeded in associating itself with any unifying idea. On the contrary, it has become too clearly associated with an undemocratic and divisive goal which is likely to deny it more than one term in office. The conclusion which then must be drawn is that the last election has changed very little, and that democratic values are still at risk here.